Neck pain following a car accident can often be attributed to a whiplash injury. Our Oakville chiropractor is an expert at treating neck pain, and is well-trained to manage whiplash injuries and pain from a car accident. If you’re experiencing neck pain as the result of a motor vehicle accident, book an appointment with one of our chiropractors today! Whiplash is a common injury that affects the head, neck and upper back. Whiplash is caused by an acceleration/deceleration mechanism; most commonly a motor vehicle accident. When the head forwards and backwards, it can cause significant strain on the muscles and joints in the neck. Our Oakville Chiropractor finds whiplash injuries can range from mild to severe, but even mild neck pain should never be ignored! Whiplash often develops in the days following an accident, and it’s always a good idea to get a physical examination by your chiropractor to help manage your pain. How Your Oakville Chiropractor Help? Chiropractors are experts at treating the spine. Our Oakville chiropractor will give you a thorough exam. There are a number of techniques that can be used to help manage a whiplash injury. When the neck is forced forwards and backwards aggressively, as it is in a whiplash injury, the muscles in both the back and front of the neck can become strained. The muscles are over-stretched, and as a defense mechanism they respond by contracting too much, and it leads to painfully stiff and tight muscles. In addition to the muscles involvement, the joints can also become jammed, stiff or stuck. 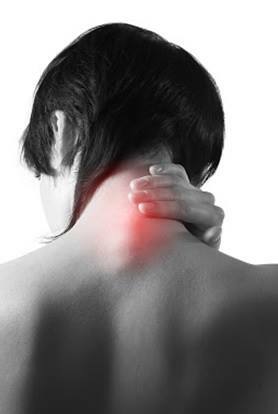 This can cause sharp pain that significantly affects the neck’s ability to move. Both these issues can have a big effect on one’s ability to carry out their daily activities. Ever tried checking your blind-spot without turning your neck? Not easy. Ask our chiropractor for help ! There are a few muscles that are most frequently involved. One muscle, the SCM, located in the front of the neck can cause all sorts of trouble. 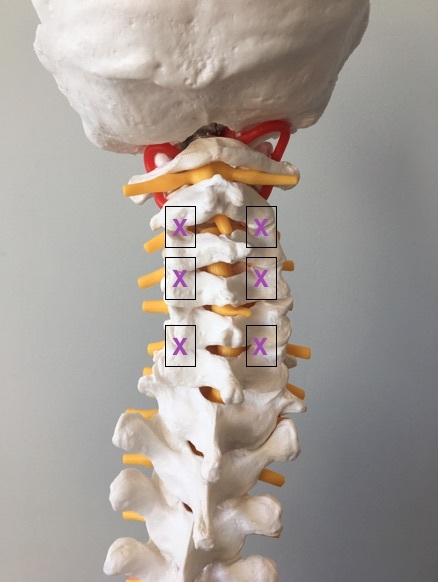 Pain felt in the very top of the head may actually be the result of a tight SCM! 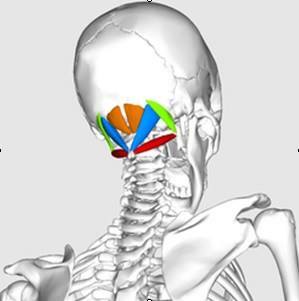 The tiny muscles in the back of the head and neck, our suboccipitals, are also common causes of whiplash related neck pain and headaches. Pain at the base of the skull may be due to tension in these muscles! Our Oakville chiropractor is trained to recognize referral patterns, and will be able to identify the muscles that need attention. Muscle release techniques are almost always included in treatment for whiplash. Spinal manipulation, or an ‘adjustment’, by your chiropractor is also an effective tool to help manage symptoms from whiplash. Spinal manipulation is a shallow, quick thrust through a stiff joint to help relieve pressure and restore movement to a dysfunctional joint. If your neck is feeling very painful, it may be hard to imagine letting our chiropractor adjust it. We’ve heard it all before! Rest assured that spinal manipulation has been shown to effectively relieve whiplash pain, and can help expedite the recovery process. One of the other ways our chiropractors can help it to rule out more serious causes of your neck pain. Car accidents can be scary, and neck pain can feel very debilitating. Pain resulting from a motor vehicle accident can make people feel nervous, anxious or even depressed. A thorough exam can help rule out serious conditions, and help ease your mind about the recovery process. Our chiropractors will help you understand what to expect from treatment, the recovery process, and help you identify potential roadblocks to recovery in order to make the healing process as quick as possible. Acupuncture, performed by Dr.Jenn, can be a very effective tool at managing neck pain of all origins, including whiplash. Whiplash is an injury that, without proper care, can become chronic and lead to months of discomfort and headaches. Acupuncture is a tool that can help in the acute stages of the injury, and even help the chronic cases reduce pain and improve function. There are a number of powerful points that can help release the muscles more frequently affected by whiplash. Some points can be placed along the joints of the neck. The acupuncture needles can help stimulate the joint capsules which can be a major cause of pain. The acupuncture needles placed along the spine can also help flush inflammation away from the neck joints, and in turn help to alleviate pain and stiffness. The acupuncture needles have the unique ability to get right down to the source of the pain, and have a direct impact on our injuries at the deepest level. One of the biggest complaints we hear about whiplash is that the back of the head and neck feel very stiff. Sitting at a desk all day, picking up you children or even just laying down can be incredibly uncomfortable. The tension in the neck muscles can be relieved with acupuncture treatment. The muscles at the base of the skull, and the trapezius are common culprits in this muscular stiffness. Luckily, there are also some very effective acupuncture points to help ease pain from these muscles. Acupuncture needles are left in the body for 10-15 minutes. Dr. Jenn will ensure that you’re in a comfortable position when you can relax for the duration of the treatment. If you’re wondering more about what is involved in an acupuncture treatment, visit our blog post to find out more! If you live in the Oakville area and are asking yourself “Where is the nearest chiropractor?” call the clinic today and make an appointment!